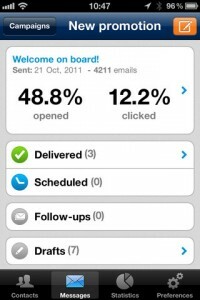 GetResponse’s free iPhone app makes managing an email marketing campaign even easier than before. An account with GetResponse is required to access the app. Its plan starts as low as $14.00 for 500 contacts. With the app, you can schedule emails to be sent out, create plain-text emails on the go, and preview versions of your newsletter before sending it out to your contacts. You can also import contacts from your iPhone address book into your email campaigns or add contacts manually to your contact list. Additionally, this app allows you to search through your contacts and view their details in real-time. The app also provides easy-to-read charts showing open rates, clicks, bounces, and other reporting statistics. Click here to read our review of GetResponse’s desktop email marketing software. Constant Contact offers a free app for iPhone users to go along with its Constant Contact account. It offers a plan for $15.00 that comes with 500 contacts. This app has many great features, including being able to create, edit, and preview your newsletters. 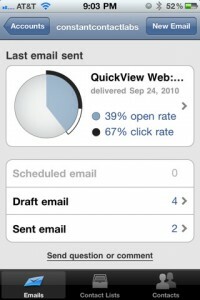 You can also schedule draft emails, resend campaigns, and view archived emails. The app comes with 10 mobile templates to choose from to help you create your email campaign. The app also comes with valuable reporting features, such as being able to view which of your contacts clicks, opens, shares, forwards, and unsubscribes from your newsletter. Like with the GetResponse iPhone app, you can import contacts from your iPhone address book. It also makes it easy to search through your contact database and make changes to your contacts’ individual records. Click here to read our review of Constant Contact’s desktop email marketing software. To find out more about email marketing services, visit our Email Marketing Comparison Chart.